Tecnicas took 2/3. Jarochita & Isis’ return from Japan. Post show promos: Reyna Isis, La Jarochita, Sagrado, Rey Cometa (says he’s recovered from a spine injury), Dragon Rojo, and Mistico. CMLL officially announced Diamante Azul is off to France once again. They say his return date is unknown. Lucha Va Voom lists Diamante Azul as being their July 26th show. Magicio took falls 2/3 to save his mask and take Mr. Apolo’s hair. Malefico was seconding Mr. Apolo, but was thrown out for interfering by commissioner Gran Cochisse in the third fall. The Guadalajara radio station that does audio of the shows also did video for this one on ACG Facebook page. The angle is good but the video quality is not so great. Still better than nothing. Weird they beat Gallito in his home building. Not a lot of coverage of these show (or the Memes one) with the AAA show going in Monterrey. Azteca/Imposible versus the Cerebros seems like a very IWRG match. Komander was hurt during the match trying a SSP to the floor. 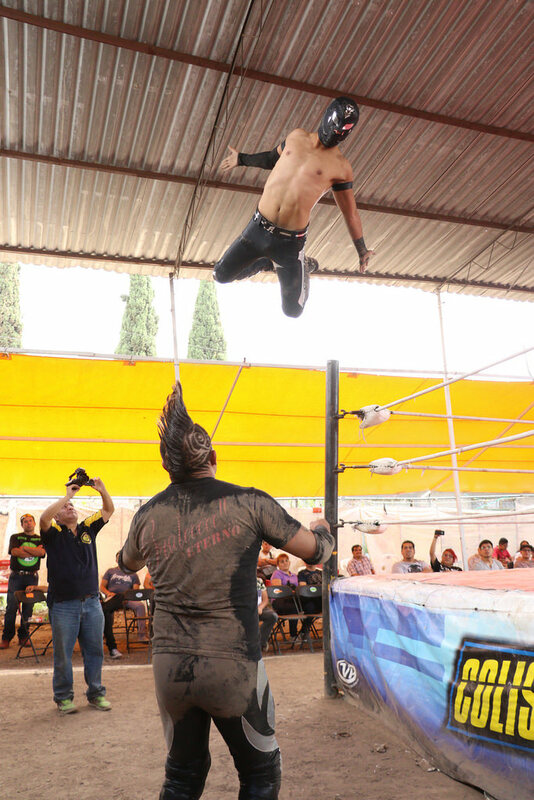 5) Hijo del Olímpico b Impulso, Karonte Jr.
Aramis vs Eterno got cited as a good match else was said. Heronia dressed up kind of like a waitress to team with the chef, which made for some amusing photos. There’s a CMLL show tonight in Arena Puebla. It’s delightfully normal following last night’s AAA craziness, though it also probably won’t have anything as good as the AAA opener. The NGD defends the trios titles against Hijos del Infierno in the semimain, where a title match seems unlikely. On the other hand, the main event is a relevos increibles trios, where an unlikely singles match (Soberano/Titan? Titan/Volador?) could be set up. Zeuxis makes her CMLL farewell, appropriately teaming with the older lucahdoras Tiffany (45), Estrellita (40) and Marcela (47) she probably was tired of facing. Guerrero Maya Jr., Stigma & Triton versus Kawato, Okumura and Puma looks like it could be good. The problem is few of the matches which look good have turned out that way. The show also includes Policeman and the Centella Rojas in the opening matches. It’ll air on CMLL’s YouTube channel at 9pm. PWPondering’s recap of the ROH New York TV tapings mentions Ultimo Guerrero vowed to bring in some partners to take on the Kingdom for the ROH Trios titles. No date was announced. Aro Lucha is holding a t-shirt design contest. If you really want to design t-shirts for pretty much free, this is a good chance to do it. Pachuca has a new official lucha libre commission. +LuchaTV has an interview with Octagon & Hijo de Octagon. It was a lot easier for Volador to get his singles match with Rush than LA Park. Note that Kawato is in the segunda; at the last, Templario seems to have passed him in the depth chart. A winding and at times confusing story ended the night with Jeff Jarrett returning to AAA become Mega Champion for the second time, Konnan (under a Parka mask) counting the pin, and Rey Fenix also appearing to attack the MAD folks. The show included a lot of MAD related skits. As part of unannounced pre-show, Vampiro explained he thought the leader of MAD was (not named) Konnan, but was so upset at the thought that he didn’t want to actually say the name. Early in the show, Juventud Guerrera did a pro-MAD in-ring promo, only to be beaten up by Vampiro. La Parka later did his own speech saying he’d stopped people from taking 20+ years and would do the same again. Texano worked with MAD in their trios match without seemingly joining the group. Midway during the show, Guerrera and Killer Kross lead out a third masked member of the group to Konnan’s music. The announcers were finally free to say Konnan’s name, with everyone being certain it was him under the mask. As everything needs to be a swerve, it of course wasn’t Konnan but actually the returning Jeff Jarrett declaring himself leader of the MAD group. Jarrett mentioned Teddy Hart as (still) in the group, but Hart was not seen on this show again. He called out Dr. Wagner Jr., and argued his way into being added into the main event. Hijo del Tirantes worked rudo/pro-Jarrett in the main event until he was finally taken out by Dr. Wagner. (Wagner immediately got a visual pinfall on Jarrett. It had been fairly likely Jarrett was going to win the title as soon as he showed up, but that spot totally gave it way.) A man in a La Parka mask and a referee shirt implied to be La Parka ran in to make the count for Wagner, but also held up instead of three. Wagner argued with “Parka”, Jarrett fouled Wagner, and quickly got the pin. Vampiro came out to confront the fake Parka, who unmasked as Konnan. Kross and Guerrera quickly came to the ring to take out Vampiro. It appeared Konnan was meant to be the true leader of MAD, but there was no time to find out – they cut to a Rey Fenix entrance video as he ran in as well, taking out Guerrera, Kross and Jarrett. Konnan and Fenix had a brief staredown, which seemed to end with them being closer to being on the same page than enemies. Fenix seemed happy to let Konnan walk away unhurt. The MAD team left the ring and the show ended before any of this could be resolved or explained. Piero, freshly bald, repeatedly tried to stop both OGT & Poder del Norte from using beer bottles in otherwise no DQ match. As it always seems to happen, Piero was taken out before the finish. Cota got the bottle, but hit Carta Brava by mistake, and Super Fly capitiliazed with a chair shot to win the brawl. Averno recognized the quality of the Poder del Norte team as they were getting their head shaved. This seems to be the end of the feud, though that’s been said before. The Fantasma/Psycho match would’ve been the most chaotic match of pretty much any other show. Psycho Clown was limping even more than on Thursday and was announced as being unable to wrestle. That seemed like a good thing, as Fantasma appears to have firmly turned rudo and argued with Psycho before the match. Psycho & Fantasma ended up fighting, with Cage & Escorpión quickly taking Fantasma’s side. Extreme Tiger & Laredo Kid, wearing ELITE 2018 shirts, ran in for the save. It was never explained, but the match was changed to a trios match at that point and Psycho was allowed to wrestle after all. The power in the arena went out just a few minutes into the match. The two teams groped around in darkness for a couple minutes, and then tried to resume their match as the lights started to come back up in the following five minutes. Cage beat Laredo Kid for the win. The significance of the ELITE shirts was never explained (and mostly was forgotten) by the end of the night. Black Taurus never appeared during the show. Laredo & Tiger were definitely técnicos, so perhaps ELITE is not meant to be a strictly rudo invasion force – no one really knows what’s going on. Likewise, Golden Magic was added to the five way match wearing an ELITE shirt. The ELITE shirt was noted but never really explained, and Golden Magic wrestled the same ways as always. The finish confused the fans: either Golden Magic broke up a pin he was not supposed to, or Tirantes counted three when on a spot that was not supposed to be the finish. Others also tried to break up the pin and looked confused at the match being over. It was not a spot Aerostar has ever won from before. Guevera at first shook hands with Aerostar and then attacked him, which turned into a very real looking brawl. Drago disappeared from the match after trying to catch a Guevera dive, which may have played into the strange ending. Pagano had a leg wrapped up to sell the beating of Thursday’s matches. He was sent awkwardly thru a table by Kross during the closing stretch of their match. Keyra was the surprise luchadora in the segunda. She and Mamba had a standoff at the start of the match. The Twitch/Space brought up their social media based rivalry, but they didn’t do much together and it wasn’t a focus of the match. Keyra herself wasn’t much of an impact on the match. Shani pinned Hiedra, then confronted Faby Apache in the aisle. Faby easily beat her up, took Shani’s mask, and said that would happen again at TripleMania. No storyline happened in the opener, thankfully. The main event was the same Jeff Jarrett match we get every time he comes in, full of stalling and rudo referee bits to cover up what he couldn’t do. It might have not just been that – the two técnicos versus one rudos structure didn’t make any sense and they were probably looking for a way to handle it – but it made this latest Jarrett run feel like all the same garbage we’ve got the last few times. If you do believe there’s value left in anti-Mexican Jeff Jarrett, then it’s hard to know why him winning the title (especially in such worthless circumstances) is going to get him any more heated up than the last few times this has been tried. If they had to give someone a title, it probably should’ve been Kross or Guerrera to justify their existence as more than goons for old men. I do not understand the big emphasis on Kross if he’s going to be (at best) the third man on the totem pole – third men on the totem pole don’t seem to have big matches in AAA. The Mysterio/Wagner parts of the match had some promise, but Wagner not being able to do a tapatia was a sad sight. Mysterio was otherwise wasted on this, a big name completely forgotten by the end of the match when five other things had happened. The bait and switch of promising Wagner/Mysterio and then not delivering it – when making a change was probably the plan all along based on the original poster – sure isn’t a positive. Not being able to trust AAA to give you the main events they’re advertising is a bad spot to go in to the biggest show of the year. The Psycho/Fantasma trios was a confusing mess early made worse by the power outage, and a minor miracle that it turned it as well as it did. The power outage at least forced them to slow down to a near stop, giving everyone a moment to process what was meant to be going on. Once they started getting going again with the lights coming up as Cage & Laredo did spots, it started to improve into something enjoyable. Those two were really consistently good, Psycho & Tiger hit big spots, and they built towards a nice finish. It was definitely an event and maybe something not watchable on a replay but was an experience live. The effort was there, and they probably can have a better match if they just had a match instead of a strange voyage. I think it’s probably possible to fashion the six way into a good highlight package. It certainly would take care some of the problems: the spots that took too long to set up can be edited into smoothness and the lack of crowd reaction can be overridden with a music track. It still wouldn’t fix the finish, which was an absolute mess that turned a crowd who was apathetic to this into hating it. We’ve seen this with the Lanzelot four way in Tijauna too: it’s really hard to get the fans to care about a multiman spot fest match with no clear story after the show has already led off with an ultimatum spot fest type of match. The closest thing to getting personalities is Guevera telling off everyone before the match and that’s not enough. This was not good – Golden Magic had a rough night by my eyes, up to going to the wrong apron to do a dive – but the crowd didn’t care much even at the good parts. Allin got in his Coffin Drop to the floor, which was good because he got just about nothing else; it felt like he got more time in the video packages leading up to the match than the actual match. There are worse matches but it was completely forgettable. MAD versus Alvardos was the usual sort of lukewarm matches the Alvarados are becoming synonymous with AAA. The beatdown was not much, and the last portion of the match was not nearly good enough for the rest. MAD probably should be having dominating matches and they’re just having matches at this point; these were the opponents because there’s not many better alternatives but it produced an expected result. Pulling out the table so soon hurt the drama, but so did Kross trying to send Pagano thru it before Pagano was ready to go. The second match was similarly forgettable, and seemed only to exist to spread out other segments. Keyra & Mamba did a couple of spots to play off their issue, but they didn’t build the match around it or Keyra was any big deal being in this match. It was a waste of a return if she’s meant to be a big deal, but maybe she’s not. Black Danger worked very hard to make Pimpinela look good. Match seemed to be either cut on time or just have an abrupt ending. It didn’t add up to a lot. The opening matches continue to be a lot of fun. Star Fire has been wrestling for the last year, but really hasn’t been on anyone’s radar since blowing out her knee in Stardom almost three years ago. It’s hard to tell if anything that early in a long show is really going to be a star making performance, but Star Fire absolutely looked like the best luchadora on a show with Maravilla, Keyra and Shani on it. And she lived after Belial crushed her with a tope. It felt like this opener got a little less time, thought the clock differs with that – maybe it was a function of having more people than those other matches, leaving some (Arez?) not to be able to stand out as much. It was more indisputably a little more sloppy than the other ones: Dinastia was looking better and faster than he has in a while but he and Último Maldito had some awkward moments. Still, he and Dinasita showed that existing AAA guys fit right in with the indie guys in the high speed openers and there’s lot of possibilities if they mix them in. Arkangel Divino looks like every bit of the star they were pushing him as in The Crash, and it just remains to be seen if he’ll get over that same way in this suddenly jam packed AAA roster.